Pulled Chicken-Easy, Fall Apart Tender, Made In The Crock Pot! Our pulled chicken slow cooker recipe is super easy with a sweet and spicy tang that makes it the perfect weeknight meal – time and time again. The early morning air has a chill on it today, and the first thing that came to my mind when I thought about dinner was the slow cooker filled with bubbly pulled chicken. 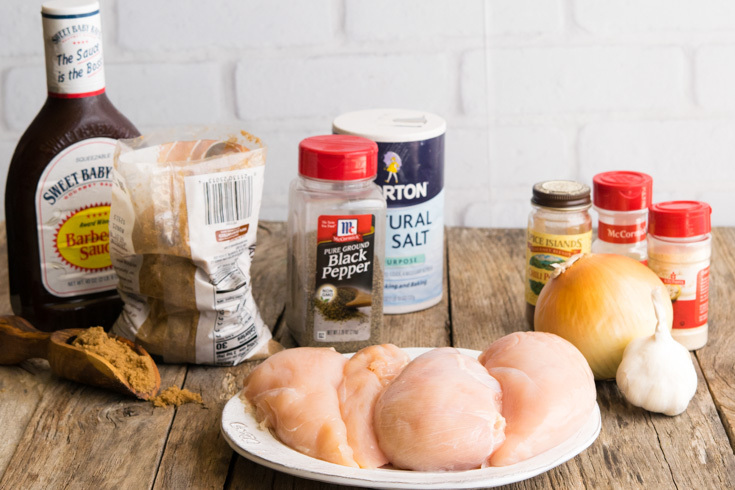 My pulled chicken recipe is beyond easy and works well as our nights go from slow summer living to the hustle and bustle of fall. Slow cooker pulled chicken is similar to our Crockpot Pulled Pork, with a flavor twist and obviously the type of meat. I love slow cooker meals any time of the year, but there’s something about firing up the Crockpot on a cold morning that makes me feel cozy and content. Delicious as is, or make it into a pulled chicken sandwich on a toasted bun. This recipe is delightfully warm and will fill every belly at your table. Sheer simplicity! This chicken almost cooks itself! Perfect for a summer barbeque or a chilly fall afternoon, this meal is great any time of the year. Much like Mexican pulled chicken, or our Mexican Cream Cheese Crock Pot Chicken, it’s so easy to make a big batch of this for a party or potluck. Sides are easy and plentiful with this dish (cornbread, macaroni and cheese, salad…the list goes on…). WE’D LOVE TO BE FRIENDS ON PINTEREST! WE’RE ALWAYS PINNING TASTY RECIPES! Made in a slow cooker, pulled chicken is an incredible combination of sweet and spicy. The chicken breasts cook to tender perfection, making it easy to “pull” or shred. There are a few variations to pulled chicken breast, but this recipe has a flavor that cannot be beaten. 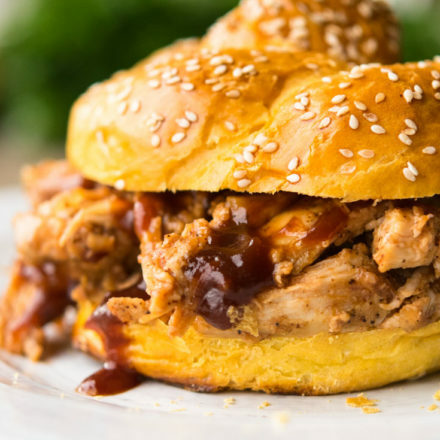 Pulled chicken can be used in so many ways. Turn it into pulled chicken tacos, pile it high on a bun to make a delicious sandwich, or use it to top a cold salad! 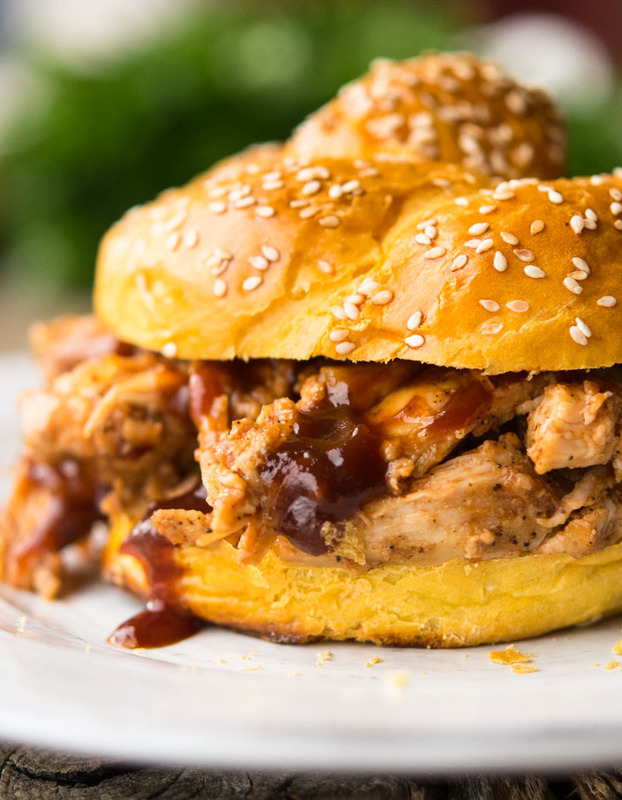 What Ingredients Do You Need To Make Pulled Chicken? Start with four large boneless, skinless chicken breasts, about six to eight ounces each. Onions, chicken broth and peeled garlic cloves make up the bottom layer of the slow cooker and add a ton of flavor. This recipe pulls most of its flavor from a homemade spice rub. For pulled chicken crock pot style, you’ll rub the chicken with a combination of chili powder, onion powder, garlic powder, black pepper, salt, and just a touch of brown sugar. How Do You Make Pulled Chicken? 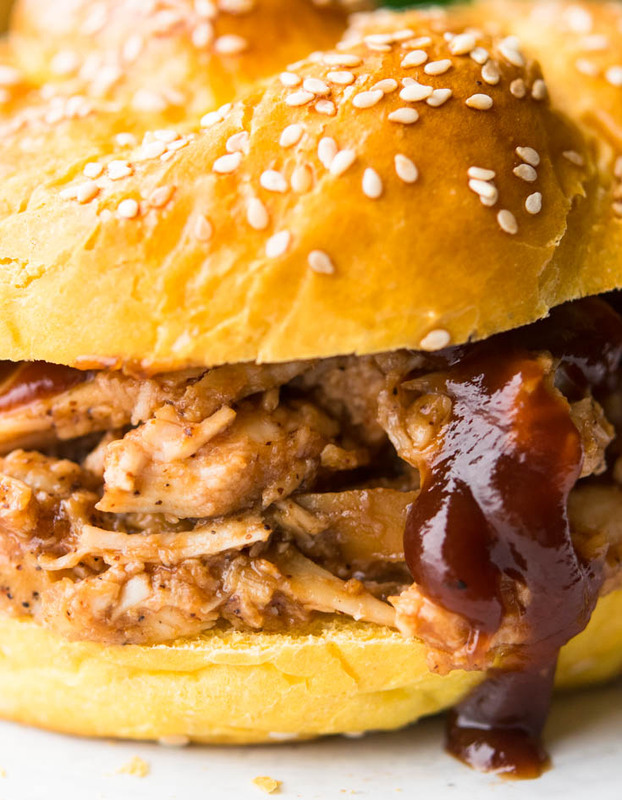 How Do You Make BBQ Pulled Chicken? With our delicious crock pot method, you simply shred the chicken, return it to the crock pot and add one to two cups of your favorite prepared barbeque sauce. Let it simmer until heated through! The barbeque sauce adds a great sweetness and tang to this dish. Our pulled chicken slow cooker recipe is super easy with a sweet and spicy tang that makes it the perfect weeknight meal - time and time again. Add the sliced onions and garlic to the bottom of a slow cooker and pour in chicken stock. In a small bowl, mix together the spice mix until evenly combined. Pat chicken breast with paper towels to remove any excess moisture from packaging. Generously sprinkle both sides of chicken evenly with spice mixture (you may have some left over). Gently press spice mixture onto chicken to help it adhere. Lay chicken, in a single layer, over onions. Cover the crockpot and cook on high 4-6 hours or 8-10 on low, or until chicken is tender. Remove the chicken to a plate and set aside. Set a sieve over a heat-proof mixing bowl and pour the onion-liquid mixture into the sieve. Place the drained onion mixture on a cutting board and roughly chop them into bite-sized pieces. Return the chopped onions to crockpot and discard the liquids. Using 2 forks shred the chicken breasts into bite-sized pieces. 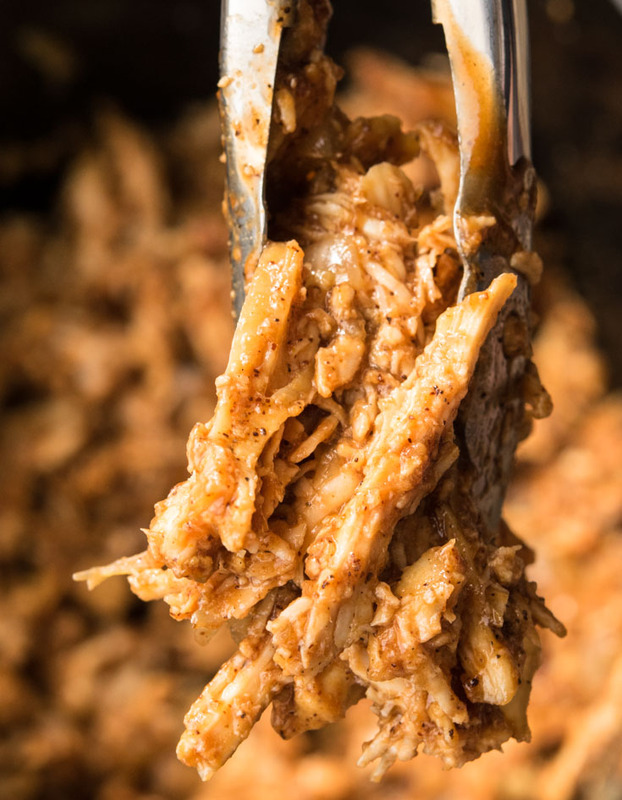 Return the shredded chicken to the crockpot and stir to combine with the onion mixture. Add prepared BBQ sauce and combine to chicken mixture. Cover the crockpot, turn on high, and heat just until warm through. Serve. Subscribe to receive new recipes delivered straight to your inbox! You’ll also get my FREE BONUS EBOOK, just for subscribers! ©GonnaWantSeconds.com. Content and photographs are copyright protected. Sharing of this recipe is both encouraged and appreciated. Copying and/or pasting full recipes to any social media is strictly prohibited. Nutrition information will vary based on the specific products. To be safe, check the nutrition facts labels of your products. Optional object listed above have been left out of nutritional data. Cook Time: Since the recommended method in my recipe is the slow cooker, I can’t stress enough that you make sure you cook the chicken until just tender to avoid it falling apart. You’ll want those nice chunks to turn into pulled chicken! 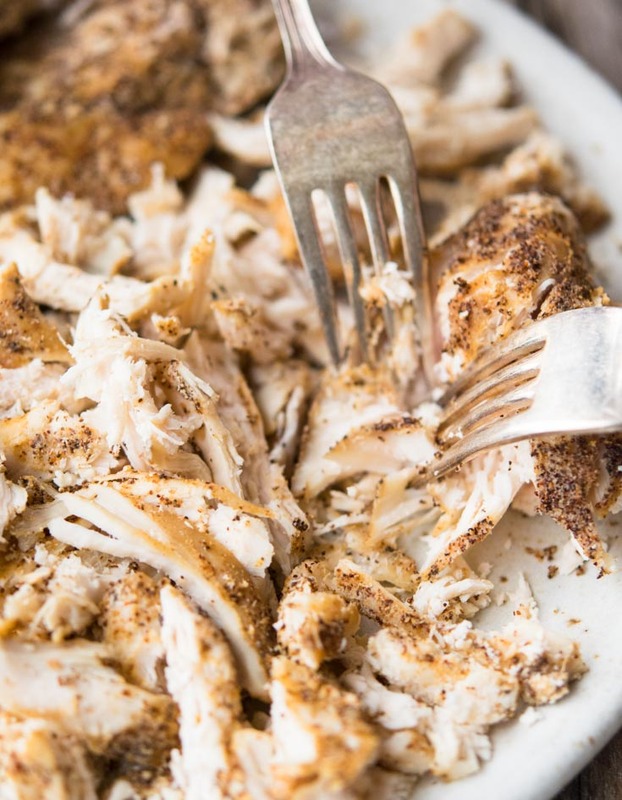 How to Shred Chicken: The best way and the only way if you ask me, to shred chicken is to remove it from the slow cooker and then transfer it onto a cutting board. Using two forks, pull the chicken until it’s nice and shredded. Don’t shred it too thin, you’ll want some larger chunks here and there. Personally, I’m not a fan of using an electric mixer method to shred chicken, but of course, feel free to go for it if that’s your preferred way of doing it! Oven Method: Let’s chat a bit about a pulled chicken recipe oven style. Preheat oven to 350. Combine spices and create a rub. Cut slices in the chicken about halfway through and rub with the spice mixture. You can line the cookie sheet with sliced onions and minced garlic if you’d like and lay the chicken on top. If you’re doing the barbeque version of this meal, pour the sauce over the chicken and let it bake right in all that deliciousness. Oh, the flavors. Grilled Chicken: Create the spice rub as you would with the oven method, and grill the chicken on a preheated, lightly greased grill. Grill the chicken until completely cooked through. Again, if you want the barbeque twist, heat the sauce on the stove or grill and cover the chicken after you shred it. Can You Freeze Pulled Chicken? Yes, you absolutely can! Pulled chicken leftovers are super easy to freeze. All you’ll need is a few freezer safe bags to portion, and then pop it in the freezer! When you’re ready to reheat, take it out, let the pulled chicken thaw in the fridge and then heat it in the oven or microwave. This freezes really well, and is just as delicious the second time around! Next RecipeOlive Garden Five Cheese Ziti Al Forno – A Delicious Copycat Recipe! OMG, this looks AMAZING! Can’t wait to give it a try in my new crockpot!! Where is the barbecue sauce in the list of ingredients? Please ignore this comment if duplicate . . . I thought I entered a comment but it did not display. Your recipe looks delicious; however, the list of spices and amounts looks a little weird to me. It is not easy to determine what amounts are needed for each spice. Can you please clarify the amounts for each spice? Thanks!! Awesome!! Thank you so much!! I’m a home cook and my favorite place to be is in my kitchen cooking up a storm. I’m also a wife, mother, Bernese Mountain dog lover, friend, daughter, sister, and reluctant exerciser. Gonna Want Seconds is a participant in the Amazon Services LLC Associates Program, an affiliate advertising program designed to provide a means for sites to earn advertising fees by advertising and linking to amazon.com.